It is significantly important now to restore the relationships with our allies. There will be longer-term repercussions of President Trump’s decisions over this trade war with allies. One of the key issues of concern during the 2016 presidential election campaign was that then candidate Donald J. Trump flared whenever he felt offended and attacked viscerally the rest of the contenders, regardless of party lines or gender. Marco Rubio, Rand Paul, Ted Cruz (along with his father and wife), Carli Fiorina, Jen Bush; they all felt Trump’s avalanche of offensive punches. Trump embarrassed, lied about, and ridiculed them when they made their case he was unfit politically and mentally to be elected to the highest office in the world. Those were the times when key GOP leaders stood up for their party’s vision of how a presidential candidate should behave, what was acceptable or not according to the standards America’s democracy had been able to achieve throughout history, and what the American people expected of their representatives and leader. It was a concern back then, it is a dreadful reality today that has gone out of hand this weekend with the drama now-President Trump injected into the world’s policial scene the US is supposed to lead. 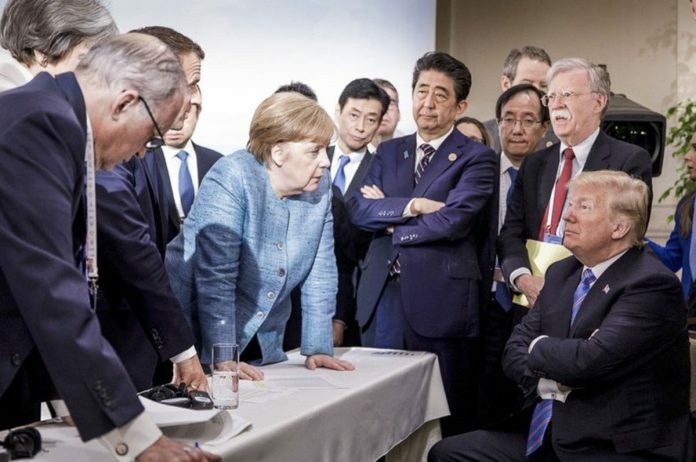 Trump raged against the world during the G7 meeting in Canada as if he were “King Me”—the character in the cover of Time’s Magazine. He raged against fellow leaders and minutes after being confronted by Canada’s Prime Minister over aluminum tariffs the Trump administration is imposing, he tore apart a crucial deal after it was signed. Trump clashed angrily with US allies, inexplicably stood up for Russia, snubbed Theresa May, left the meeting early, and gave a usually rhetoric press conference bashing his own country’s media networks. The total communication meltdown caused by a temperamental leader who often acts irascible towards fragile situations and criticism, does not hold up to the leading role view the world has of the United States of America. Along with the “America First” policy President Trump is implementing, fraction with key US allies who have stood up arm in arm with us in war and peace, will somehow bring about side effects to our nation. Trump’s “America First” orientation assumes that the United States, as the world’s dominant actor, can behave freely and independently in trade. But “America First” fails to make logic calculations and disregards how America’s trading partners will respond to the new U.S. protectionism – which is also what American lawmakers ignored during the Great Depression. America’s top economic position does not shield it from the dire consequences that unilateral trade policy can provoke. If the rest of the world increases trading goods that the United States does not produce, then the U.S. export share will fall—even if U.S. firms remain just as productive as their competitors in the goods that they do export. The Federal Reserve Bank of New York in 2012 published an investigation made into this possibility and found that the US lost ground to its competitors in the export of certain products that were expanding briskly as a share of world trade—in particular, machinery and transportation products. In 1934 American lawmakers passed the Reciprocal Trade Agreements Act to fix the infamous Smoot-Hawley Tariff Act of 1930 —which raised duties on hundreds of imports— and the U.S. trade policy became global and strategic. Now there are dangers in ignoring history. There will be longer-term repercussions of President Trump’s decisions over this trade war with allies. When he withdrew the US from the Trans-Pacific Partnership, Trump denied American exporters enhanced access to foreign markets and was a gift to Chinese influence in Asia. During Trump’s trip to Asia, 11 signatories of the original trade deal, including Japan, Australia, Canada and Mexico, agreed to move forward without the U.S., making it harder for American companies to compete in their markets. American producers will soon see their prices being undercut by Canadian, British, or French producers in the wake of new coming trade agreements. If the United States is reluctant to participate in multilateral trade agreements, other countries have every incentive to do deals that exclude and even may hurt the U.S. It is significantly important now to restore the relationship with our allies. Sen. John McCain pushed back Saturday night against President Donald Trump’s reversal of the G7 agreement, saying that Americans would continue to stand with its historical allies. But the country also needs other key officials to stand up to President Trump because, even though the bipartisan majority of Americans remain pro-free trade, little could be done if the President continues making disastrous decisions or acts upon impulsive feelings. The short-term legacy of a Trump presidency is already showing that the way Trump reacts to criticism affects the daily lives of Americans and people all over the world. The spat with our allies may just be the beginning of a new chaos and needs correction.